Industrial strength workers deserve industrial strength care. 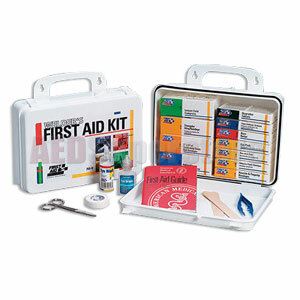 Our 113-piece, 16-unit welder's first aid kit focuses on a wide range of injuries common to welders such as minor cuts, sprains, welder's arc and other common eye irritations. Products are contained in a sturdy plastic case with gasket. (1) M-702: Industrial eye drops, 1/2 oz. (1) Eye wash, 1 oz.